Pointer: Julep “Caroline”. A very vampy blackened red shimmer. If you’re feeling dark and bold, this one is for you. Two coats shown here. 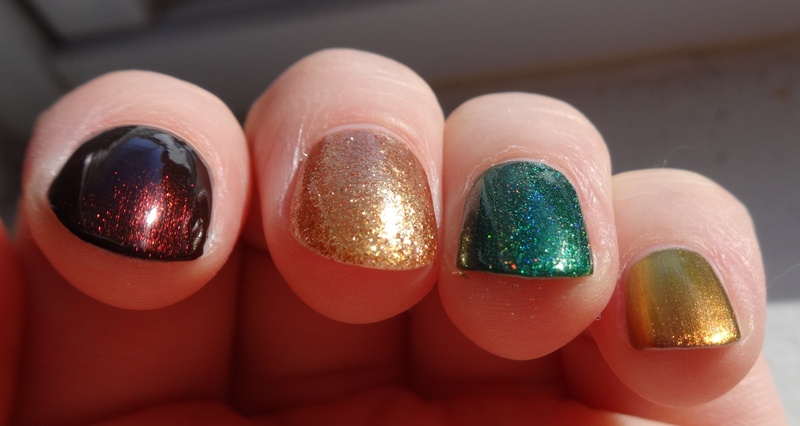 Middle: OPI “Goldeneye”. Packed with bright gold flecks. 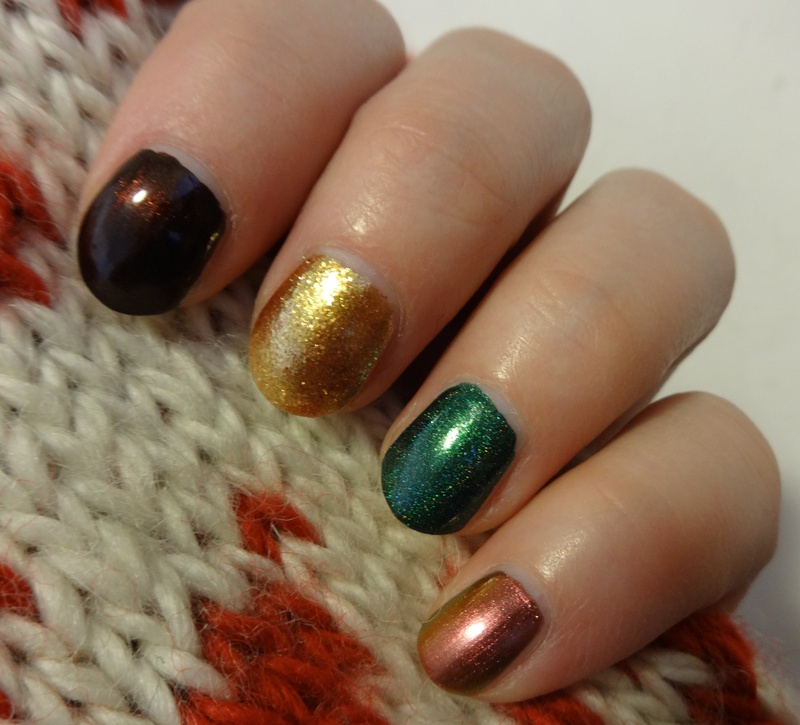 This one is the last year’s James Bond collection, and it’s great on its own or as a glitter gradient (it would go great as a gradient accent with any of the holiday colors). It take three coats to be opaque on its own (as shown here), but this is my all-time favorite gold. Ring: I Love Nail Polish “Evergreen”. A nice, bright holographic green. The color is perfect and the holographic effect is nice and strong in both sunlight and indoor lighting. Two coats shown here. I think this would be also great for Christmas tree nail art. Pinky: Dance Legend “Boo”. 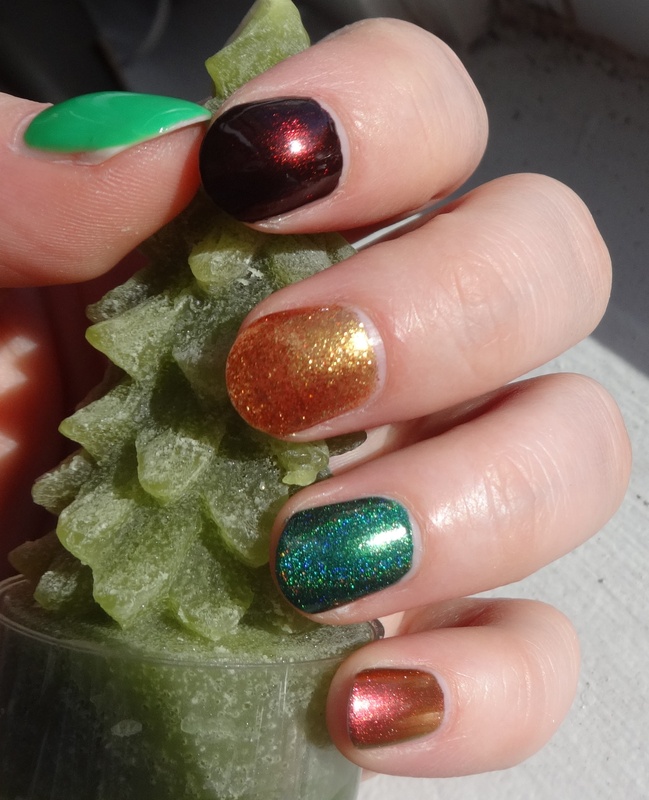 A red-orange-green shifting multichrome. See here for my review. It’s a really easy color to work with, so I want to wear it all the time. Plus, the shifting reds and greens are perfect for the holidays. 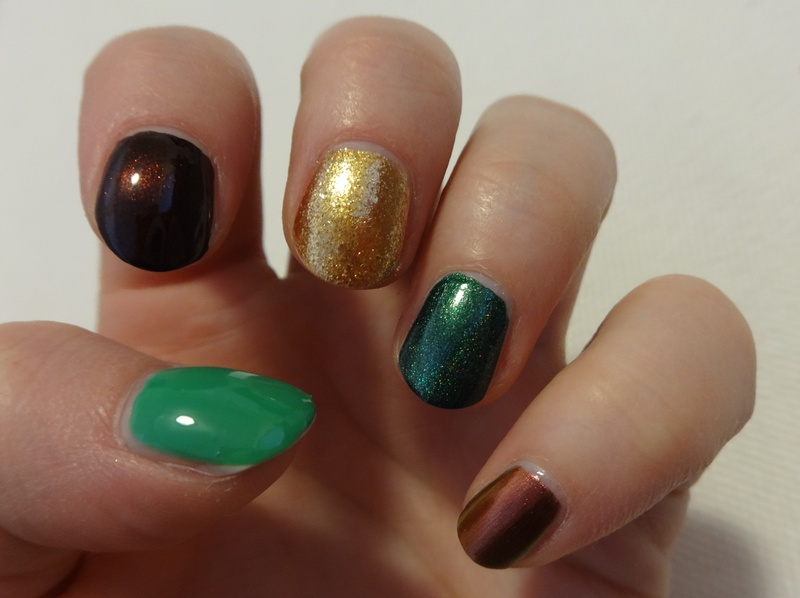 Bonus: Julep “Payton” on the thumb. A bright kelly green creme- practically neon. You have to be really committed to green if you want to wear this color, but if you’re feeling something just a little loud and preppy, go for it. Enjoy a glimpse of my holiday decorations. What do you think of my selections? What will you be wearing for the holidays? Love the Caroline one!! Will there be another category like subtle subtle? My collection veers toward the unsubtle, but I bet that I can round up some quieter shades for the winter- “January neutrals”.